The ninth “deliberation” in Søren Kierkegaard’s Works of Love (1847) is called “The Work of Love in Remembering One Dead.” Though it has been accused of suggesting that loving the dead is preferable to loving the living, Kierkegaard’s argument is actually far different. As he sees it, one of the pitfalls of human relationships is that, even when they flourish, there is a quid pro quo involved. It is not so, however, when one loves the dead, for to love the dead is precisely to love one who can give nothing in return. Hence, for Kierkegaard, the practice of loving the dead is a kind of “training” for loving the living. It teaches one to seek love even when it is not (palpably) returned, to allow oneself to be oriented by love even in the face of grim reality. In this way, the loving one comes to reflect the love of God. Stephen Frears’ Philomena might be seen as a meditation on Kierkegaard’s insight. Inspired by a true story — albeit with a few key deviations — it tells of Philomena Lee (Judi Dench, in a poignantly understated performance), an Irish woman who longs to be reunited with the son she gave up for adoption almost fifty years before. But there are significant obstacles. Philomena’s son was conceived out of wedlock, and, as punishment, she was sent to work at Sean Ross Abbey in Roscrea, Ireland. In turn, the abbey’s nuns legally assumed control over her affairs, including her baby. So, when they approved the child’s adoption by an American family, Philomena was not only powerless to prevent it but even excluded from any knowledge of his whereabouts. It was, in any legal or political sense, as if she had never known him. And yet, one of the presuppositions of Philomena is that love cannot be reduced to the juridical or to the political. Love has the unique quality of being limitless, uncorrupted by worldly realities or the ravages of time. 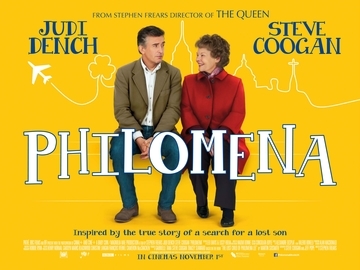 Hence, when journalist Martin Sixsmith (a mordantly amusing Steven Coogan) agrees to help Philomena find her son, she jumps at the opportunity. Philomena and Sixsmith are the proverbial odd couple, and Frears mines their relationship for both humor and perspective. Philomena (despite everything) is a devout Catholic, while Sixsmith is an atheist, who cannot reconcile faith in God with the atrocities of the news cycle. Ultimately, the validity of their respective worldviews is tried in the extreme. Following a number of leads, they learn that Philomena’s son, after a successful career, died of AIDS and requested to be buried in Ireland — indeed, at the very abbey in which he was born. Sixsmith is livid. The nuns had told Philomena that they knew nothing of her son’s fate. Thus the pair travel back to Roscrea, where a climactic confrontation takes place. Indeed, it is here that the film’s theme crystallizes. Frears depicts two opposed institutions — that of a church seeking to protect its interests and of a press hostile to everything but a marketable story. Philomena refuses to join either side. She is angry with the sisters of Sean Ross Abbey, even as she wants nothing to do with Sixsmith’s cynicism. To be a Christian, she understands, is about love. And it is the love that she has for her son — a love that is its own gift, for it asks nothing of the other — that now teaches her to forgive. As is well-known, many have objected to this denouement, noting its historical inaccuracies and (potentially) anti-Catholic undertones. Granted, the portrayal of one Sr. Hildegarde (Barbara Jefford) is, in effect, pabulum, pandering to the crudest stereotypes of Catholic nuns. And yet, Philomena does not dwell on this point. As the film comes to a close, Philomena visits the grave of her son. A chastened Sixsmith joins her there, and he presents her with a small figure of the Most Sacred Hart of Jesus. The aging woman places it on her son’s gravestone — a symbol of the love in which she shares and still finds hope.